Anna Sui La Vie De Boheme displays versatility of character of women. Anna Sui La Vie De Boheme - 75ml. EDP - A woman who believes in fairy tales, always captivates the imagination of others. She is actually worthless. This lady is charming surrounding his clear way mesmerizing magic voice and, of course, charges extraordinary dreams. It costs nothing to become at some time in the fairy to fulfill someone else's dream. What gives a woman power? Her secret is simple - perfume Anna Sui La Vie De Boheme This fragrance itself is already wonderful. It all magically, starting with a fancy bottle, made ​​in the shape of a flower, on which sits a butterfly. Composition only validates the guesswork - we magic elixir. After all, where else can so organically blend notes of Turkish rose, magnolia and black vanilla, generously seasoned with spices. Anna Sui De La Vie Boheme - aroma, which is easy to believe in miracles. After all, every time you encounter it, touching the coveted bottle. 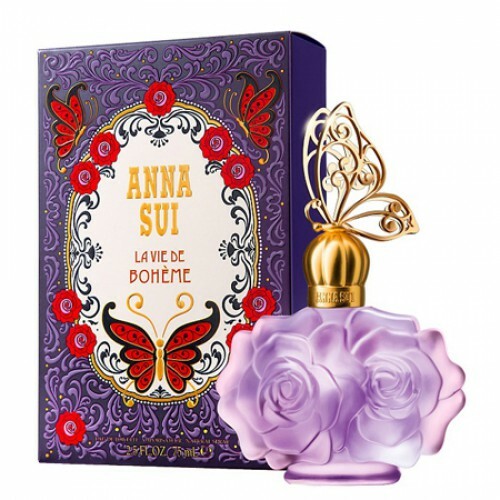 Brand Anna Sui in 2012, released the fragrance, which is called La Vie de Boheme ("The Bohemian Life"), it was developed in cooperation with Inter Parfums. Fragrance Anna Sui La Vie de Boheme displays versatility of character of women: it is slightly romantic and a bit cheeky, but also she loves to improvise. Perfume reflects the nature of the modern woman, her view on fashion: clothing and footwear, handbags and hats. All of these things look different at all times, each generation tries to bring his vision of these things, adding a unique expression of style. Also for the ladies, which oversees latest fashions, we can offer the fragrance Armani Code Couture Edition. Fragrance La Vie de Boheme opens with notes of pear, rose and berry fruit dragon. Middle notes of peony flowers are expressed. Flex perfume are dry wood chords delicate musk, sandalwood and vanilla black. Scent captures the multiple faces of women: it's a bit cheeky, slightly romantic, sometimes likes to improvise. In essence, the perfume is a reflection of the nature of the modern woman. Of course, the look, clothes, a variety of dresses, pants, boots and a hat - all this looks different at different times, in a constantly changing world of fashion, but each generation brings its vision of beautiful things, adds its own unique expression of personal style. The main idea of ​​the flavor La Vie De Boheme is a romantic adventure, curiosity, creativity and love of travel. The perfume was designed by Philippe Romano. It opens with floral notes of rose, fruity accords of pear and berry fruit dragon. Heart aromas expressed flowers peony , and reflect a symbol of luck, feminine beauty and friendship, in accordance with the concept of the brand. Flex perfume consists of dry wood chords, notes of sandalwood, musk and delicate spicy accents of black vanilla.